Located on Kauai's verdant North Shore, Anini is a haven for the traveler who wants to experience the unspoiled natural beauty of Hawaii. Protected by a large outer reef, the quiet waters of Anini are perfect for swimming, snorkeling, fishing, kayaking, windsurfing, and sunning. Follow Anini Road almost to the spot where it dead ends at Anini Stream and you will find Hale Kai, a lovely, three-bedroom, three-bath home situated on over a half acre of lushly landscaped land fronting the blue Pacific. Constructed of natural cedar throughout, the home is fully and tastefully furnished for the ultimate in vacationing comfort. * King-sized bed in master suite. Private bathroom with tub/shower. Two twin beds in each guest room. Guest bath with eight-foot by three-foot shower. Full bath with shower downstairs for after-beach convenience. Covered deck with table, chairs, and chaise lounges (perfect for whale watching during the humpback whale migration season!). * Fully-equipped kitchen with four-burner gas range with oven, full size refrigerator, dishwasher, microwave, wet bar, six-foot bar/serving counter, coffee maker, toaster, blender, mixer, etc. * Stereo entertainment center which includes 36-inch color cable TV. * Other amenities include washer and dryer, telephones, barbecue, and beach toys. We provide FREE HIGH SPEED INTERNET ACCESS (via Cable), FREE UNLIMITED LONG DISTANCE CALLING (within the USA), CALLER ID, 3 WAY CALLING, AND *69 (enabling you to dial the last number who called you). Bob and Suzi are on island and can be reached by email at rentals@nakearentals.com or 808-431-4659. 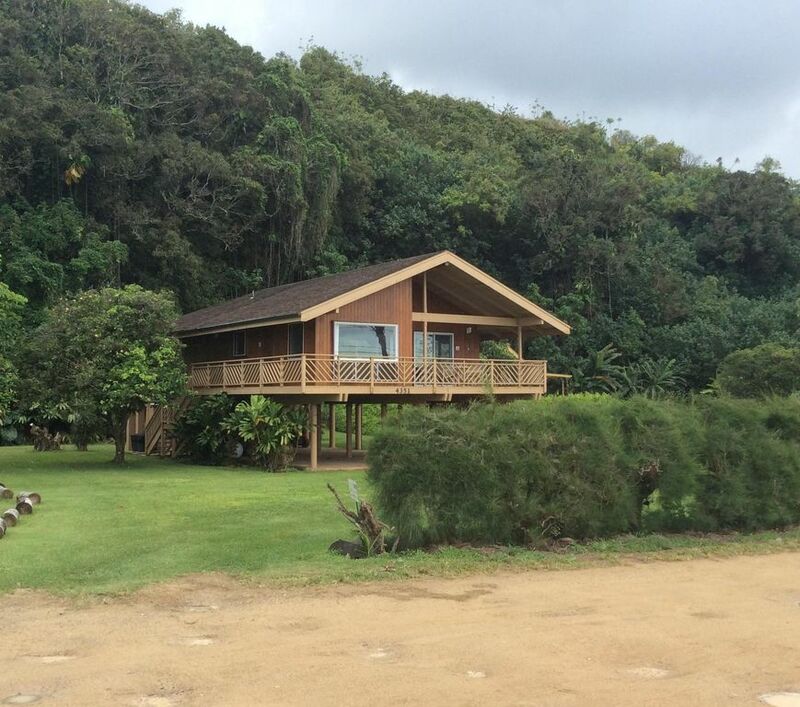 Hale Kai is fully permitted as a transient vacation rental by the County of Kauai. Our Non Conforming Use Certificate number is 5083. In the North Shore's idyllic setting you can: swim, surf; sunbathe, scuba dive or snorkel, wind surf (with rental boards and lessons available at Anini Beach Park), go shore fishing, book a deep water charter; beach comb, go horseback riding at Princeville Stables, watch polo games at Anini Beach, hike the island's awesome trails, enjoy gourmet dining, work out at the Princeville Spa (featuring daily and weekly memberships giving access to the latest exercise equipment, large lap pool, Jacuzzi, wet and dry saunas, and numerous aerobics, yoga, aqua -size and weight training classes), pamper yourself with a facial treatment or full body massage, whale watch, take a Na Pali Coast boat tour or a sunset sailing cruise in Hanalei Bay, book a helicopter tour of fabulous Waimea Canyon, play tennis, enjoy worldclass golfing (with discounts at Princeville's Makai and Prince courses), drive around the island and take in the sights, or just simply lie back and bask in the simple glory of being in one of earth's most naturally beautiful and peaceful places. Hale Kai's location almost at the dead end of Anini Road (1/5 mile after paved road ends and gravel and sand road begins), where there is only a single row of homes along the beach, means that our guests enjoy quiet and privacy not found along most of the rest of Anini. The protecting reef (one of the largest in Hawaii) assures that the waves break far out and not on the shore, and the calm shoreline and shallow waters make the area in front of the house ideal for swimming and snorkeling most of the year (except during periods of high winter surf). It is a wonderful beach for small children as it has a smooth sandy bottom (no holes to worry about!). We had such an amazing time at Hale Kai. We did not want to leave! The location can’t be beat, the house had everything we needed and was very comfortable. The only thing that could be improved is to note that the grill is charcoal so guests come prepared. Thanks you for sharing your lovely home with us! We made some special memories. Very cozy house with everything we needed! Great house, great location & very nice people to deal with. We would recommend it strongly. Kauai vacation at its best! We had a wonderful time here. The beachhouse is right on the water and a perfect spot to hang our with small kids. It had all the necessities to set up house for a week. Perfect place for a family get away! We enjoyed our stay at this lovely house on Kauai. It was very clean, with a great kitchen, comfortable bed, covered lanai with wonderful ocean view. A restful stay off the beaten path. Perfect and lovely in every way. We can't wait to come back! During the holiday season, there is a one week minimum for Christmas and a one week minimum for New Years Eve and Day (both can be done by the same guest making it a 2 week stay).